The nameplates have received some updates on the PTR recently. In addition to the above change, almost all elements have received parentKeys. frame.healthBar.texture = frame.healthBar:GetRegions() --No parentKey, yet? frame.absorbBar.region1 = frame.absorbBar:GetRegions() --No parentKey, yet? Not sure what region1 is, probably texture like the others. frame.castBar.texture = frame.castBar:GetRegions() --No parentKey, yet? Edit: "OnValueChangd" for healthbars now returns values between 0 and 1. Hopefully this is unintended, as it will make it hard to get exact values for nameplates. Last edited by Blazeflack : 09-01-15 at 12:29 PM. Interesting, this should make it simpler to identify the various nameplate regions. 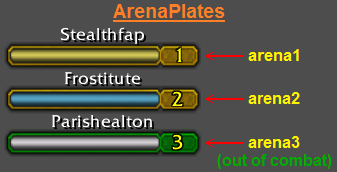 It would appear the "OnValueChanged" script on the nameplate healthbars has been changed as well. It now returns values between 0 and 1, both included. Which file is this in? There is no file. It was manually discovered on the PTR. I please you , anyone who knows how , he could update infinityplate ? Anyone figured out how to porperly show health values and health max values with nameplates now? Last edited by Resike : 09-02-15 at 11:40 AM. The only way is to use the UnitHealthMax API when you mouse over a nameplate, then cache that value so you can use it later. Multiply the return from healthBar:GetValue() with the cached MaxHealth to get a guesstimate of the current exact health value. This will obviously lead to examples where the exact value isn't 100% correct, as a player could receive or lose a health buff right after you cached his MaxHealth. In that case you would need to mouse over that player once more to grab the new MaxHealth. Last edited by Blazeflack : 09-02-15 at 12:33 PM. This is retarded. Why the heck they had to do this? How hard is it to calculate the percentages by themselfs? And use HookScript on the health bar's OnValueChanged and OnShow to update it. Thats not really the issue, the old percentage functions should work fine even unchanged. The real issue here they probably made the change since the default name plates only show percentages, so better to remove any other usefull information about it. Nice, but i don't get it why can't they just hotfix it in a wednesday maintenance. All UI changes require a patch. Can we catch nameplates now using if Frame.ArtContainer instead of if Frame:GetName() and Frame:GetName():find("NamePlate") ? Or are there any other children of the WorldFrame with also an "ArtContainer" member? Last edited by Spyro : 09-12-15 at 10:18 AM. I don't know if there are other children with that specific element. You would need to test it, but I suspect it might be possible to do it the way you suggest. Edit: I did a test and only captured Nameplates with the .ArtContainer element. Last edited by Blazeflack : 09-12-15 at 12:49 PM.